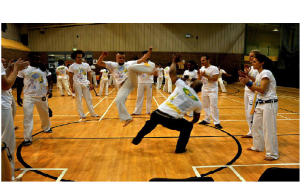 Capoeira Brazilian Martial Arts - School Of Hope and Glory. Capoeira Brazilian Martial Arts . Its foundation is based on acrobatics, music, dance, ritual and tradition. Capoeira was originated by the African slaves taken from Africa. Mainly western Africa to work in the sugar cane plantations in Brazil around the 16th century. Through the years. Capoeira has developed into a complete fighting system. Offering head butts, elbow strikes, knee strikes and take downs. The result gives a unique experience to its practitioners. In recent years Capoeira became a significant cultural export of Brazil. Along with Samba and football. This is set to increase as the football world cup and the Olympic Games are planned to be held in Brazil in 2016. The game of Capoeira is played in the Roda. Brazilian Portuguese for ‘circle. That’s created by other Capoeira players and spectators. Who would surround the players. The two players enter the Roda. And engage in a dialogue of offensive, defensive and acrobatic movements. Conducted to the rhythm of the berimbau and the song being sung by the Mestre (master) of the Roda. The berimbau is a single string percussion instrument that is unique to Capoeira. The Mestre plays the Berimbau and sings in a call, with the people forming the Roda. The rhythm style, speed and song lyrics dictates the type of Capoeira game being played. This can be a slow rhythm. To which the players would move slowly and perform ground techniques. Or a faster rhythm which would cause the players to execute fast, rapid kicks and movements. As part of the training in Capoeira. Students are encouraged to learn how to play all 5 musical instruments that generate the Capoeira music. Singing and speaking in Brazilian Portuguese is also encouraged. Engaging in flourishing acrobatic movements. Above all learning how to express themselves and how to utilize the self defence elements within. Training in Capoeira regularly will improve your strength. Flexibility, fitness, balance, special awareness, coordination, confidence and self-esteem. If that’s not enough. You will also benefit from the super high cardiovascular and muscle toning work outs! So why not come and sing. Shake a leg and learn a totally unique Martial Art! Submit URL – Submit A Site. Recreation and Leisure Web Backlinks.